Today's Gospel is one of the few times when we see Jesus getting frustrated with his disciples—and who could blame him. A man arrives to the disciples with a son who is very sick and is always falling into fire and water. The man asked for healing and the disciples were unable to do anything; Jesus came along and cured him. Jesus got frustrated that the disciples could not heal the man and asked how long was he going to have to be with them til they understood who he was and what faith meant. 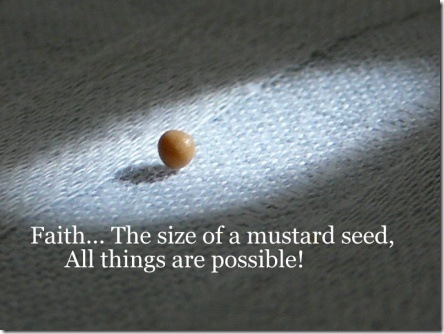 In the last part of today’s Gospel, Jesus declares that faith is the answer to all our problems: if we had faith the size of a mustard seed we could tell a mountain to move and it would move. Faith is trust in God, trust that God shall be true to his word and that he shall do for us what we ask of him as long as what we ask is in accordance with his will. Faith is a virtue that we can grow in, we practice a little faith and it works so we practice a little more. Eventually we come to know that God can be relied upon to keep his part of the deal: we believe, he works. This is a lifelong process, part of the ongoing work of being a Christian, part of the struggle that makes life worthwhile. We should try to enter the struggle with gusto and try each day to grow a little more, to stop and listen to what God is saying to us in our hearts and to put that into practice. Then we grow in faith!